Let's start off with this... there are certainly different holiday lightings I've missed, and I'd love for you to share those in the comments so we can visit them and photograph them for next year. That being said, Christmas lights are a wonderful and awe-inspiring sharing act by communities all over our state. Let's celebrate the season. Here are 20 of the best places to view holiday lights in Arkansas, with links that will take you to even more information about each one. 20. Pocahontas. Throughout the holiday season, this community at the north end of the Arkansas Delta is lit up and gorgeous... but it's extra special the week of December 19th-24th, when it celebrates in high style with Candy Cane Lane. Here's a link with places to stay and eat. 19. Siloam Springs. This storyland display by such a friendly community brings in those in the know... to come celebrate the holidays, small-town style. Learn more about the community here. 18. Conway. Downtown has its display, but the real show is out on Tony Circle, where private homeowners one-up each other to see who can come up with the greatest display each year. Check it out, here. Or watch the video from last year, below. 17. Mountain View. The old fashioned Christmas lights on the square are a great nostalgic trip. Pair your viewing with a tour of Blanchard Springs Cavern for outstanding choral music with Caroling in the Caverns. 16. Eureka Springs. Downtown is the place to shop, even in the evenings, and the holiday lights in Basin Park are gorgeous. Be sure to visit the 1886 Crescent Hotel, and if you have time, see the lights at the Great Passion Play. 15. El Dorado. 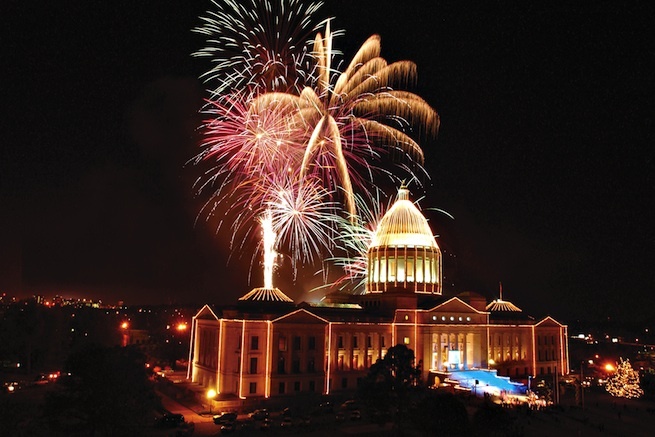 South Arkansas celebrates the season with the Holiday Light Extravaganza. Check out all the deals in town for the celebrations! 14. Rogers. Enjoy three different lighting displays with the Holiday Hoopla. 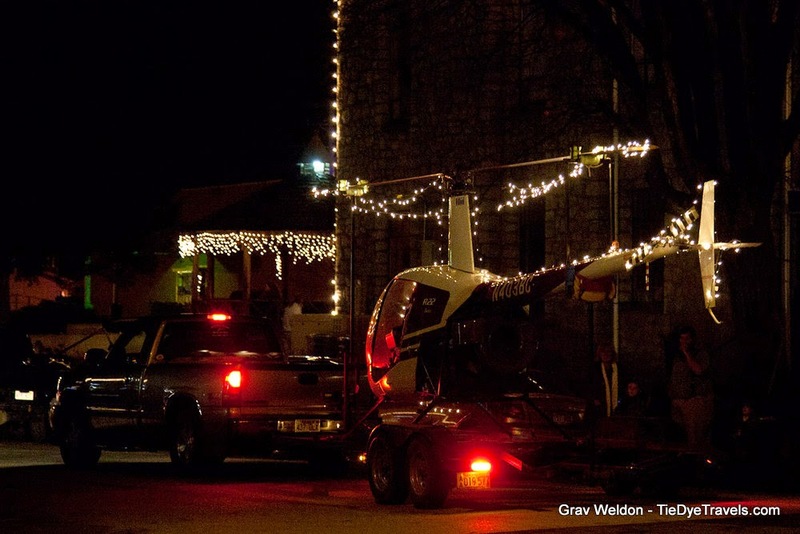 Christmas lights have become part of the vernacular in this northwest Arkansas town. Read this blog post to see what was popular last year. 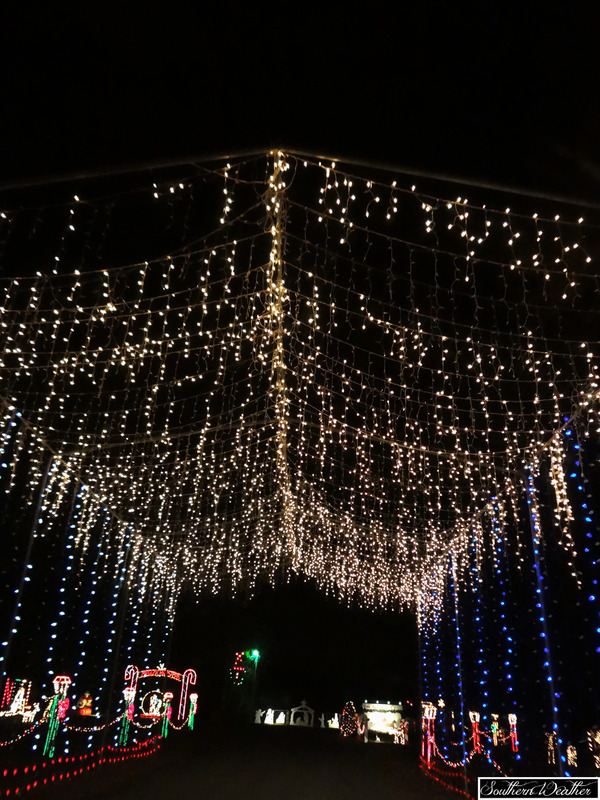 If you have time, roll over and view the Christmas Lights on Collin Circle. 13. Pine Bluff. The Enchanted Land of Light and Legends is Arkansas's longest holiday drive-thru, with 1.3 million lights and 240 different displays. It's free (donations accepted) and it runs through the 31st! 12. Searcy. After five years, the Searcy Holiday of Lights has returned with gorgeous displays all over town. Check out the website and follow on Instagram. 11. Jasper. This Ozark enclave tucked along the Little Buffalo River brings a truly quaint, homestyle Christmas out to show. I know this as a certainty... we arrived in Jasper about this time last year to the Christmas parade! 10. Bentonville. An ice skating rink, nativity and an entire downtown square aglow makes Bentonville a very special location to experience the holiday lights, as you can see in the video above. And then there's Bentonville Heart Lights... an animated display to music on Edgewood Avenue. See some of the show, below. 9. Little Rock. Throughout the holiday season, the State Capitol is lit and decorated and open to the public. Take time to view the nativity scene on the south side of the complex. Lights are up all over town. Be sure to head west and view the giant Christmas Tree at The Promenade on Chenal. 7. Fort Smith. Downtown delights on Garrison, the widest Main Street in America. Drive the historic Belle Grove district and spend an evening with the childlike wonder of lights in Creekmore Park. And roll on to the Settle Family Christmas Lights on Cork Street. 6, Sherwood. 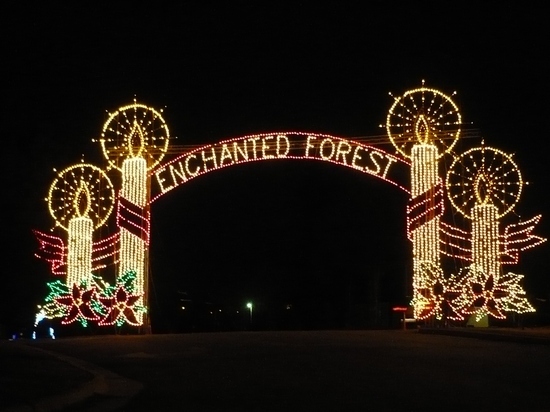 The Enchanted Forest of Lights is one of Central Arkansas's more popular drive-through displays. This year the route has been reversed... but you'll still love it. 5. Historic Washington State Park. The entire state park is decorated for the holidays with historic flare, but you'll really want to be there December 12th for Christmas and Candlelight, when the whole park is decked out in candles. 4. Batesville. The entire downtown decks out for the holiday seasons, and you can enjoy them from the back of a horsedrawn sleigh. 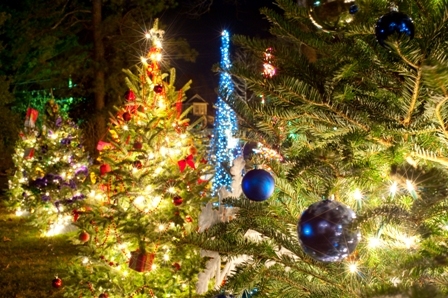 Check out all the holiday events, and roll out to Riverside Park to see the big display. 3. Hot Springs. While the downtown is gorgeously lit for the holiday season, the real holiday splendor comes at Garvan Woodland Gardens, where more than four million lights shine in this gorgeous wooded park. Watch the video at ArkansasMatters.com! 2. Blytheville. With more than six million lights and more than 40 motion displays, the annual Lights of the Delta is a driving tour you won't forget. 1. Fayetteville. Each year, downtown Fayetteville is covered in lights from one corner to another. This year's display is the best ever. Lights of the Ozarks is a celebration of light and sound you'll never forget. There are all sorts of holiday light displays around the state. 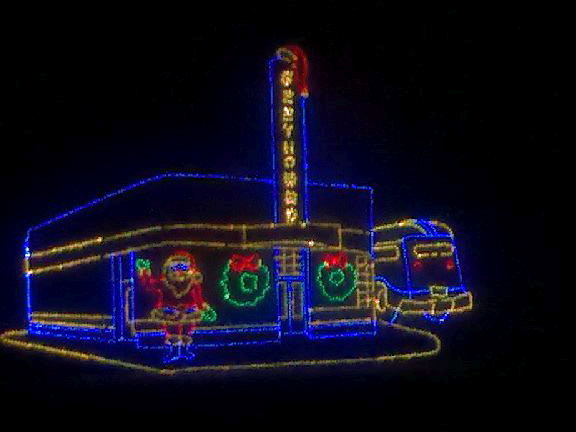 You'll find itineraries around some of those lovely lighted destinations at Arkansas.com as part of the Arkansas Trail of Holiday Lights. And if this isn't enough for you, head over to Tacky Light Tour and view all sorts of private Christmas light displays both in and outside of Arkansas! And if that wasn't enough, here's one in Cabot. And check out this guy in Mabelvale. The lights in each place are very unique and beautiful, but are these lights only decorated every Christmas?